Although the Sun seems ageless and never changing, it is a star like any other. It’s only a bit older than the Earth itself, and like every star it formed from the gas and dust of a stellar nursery. 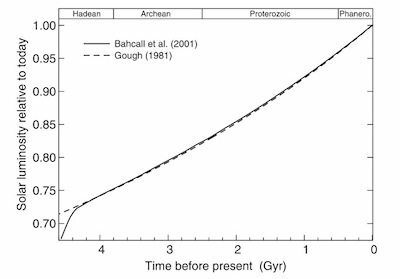 As we’ve come to understand stellar evolution, it has become clear that stars get warmer as they age. Billions of years ago, our Sun was about 70% as luminous as it is today. That means young Earth received less heat from the Sun than it does today. So much less heat that it wasn’t enough to sustain liquid water. But geologic evidence clearly shows that there were oceans of water in Earth’s youth. 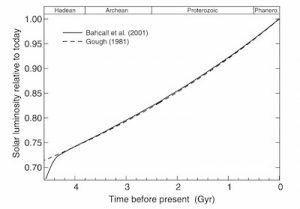 The luminosity of the Sun has changed over billions of years. This is known as the faint young Sun paradox, and it remains a big challenge. Over the past few decades we’ve learned how atmospheric composition can drastically affect surface temperature on a planet. While Venus is warmer than Earth, it’s thick atmosphere makes it even hotter than Mercury. Mars, on the other hand once had liquid water on its surface due to a thicker atmosphere. But while Earth did have a thicker atmosphere in its past, that can’t fully account for young Earth’s oceans. It’s not just the amount of atmosphere, but its composition that plays a vital role in surface temperature. Greenhouse gases like methane and carbon dioxide are far more effective at trapping solar heat than other compounds. Measurements of Earth’s young atmosphere taken from air trapped in rocks show that methane and carbon dioxide levels weren’t high enough to maintain liquid water on Earth. One possible solution to the problem is that Earth’s early atmosphere had high quantities of molecular hydrogen. Today our atmosphere has very little hydrogen. It’s so light that it can escape Earth’s atmosphere pretty easily. But it does so with the help of ultraviolet light. Since Earth’s young Sun was cooler it produced less ultraviolet light, making it more difficult for hydrogen to escape. Hydrogen is not a particularly strong greenhouse gas, but it can trap heat. 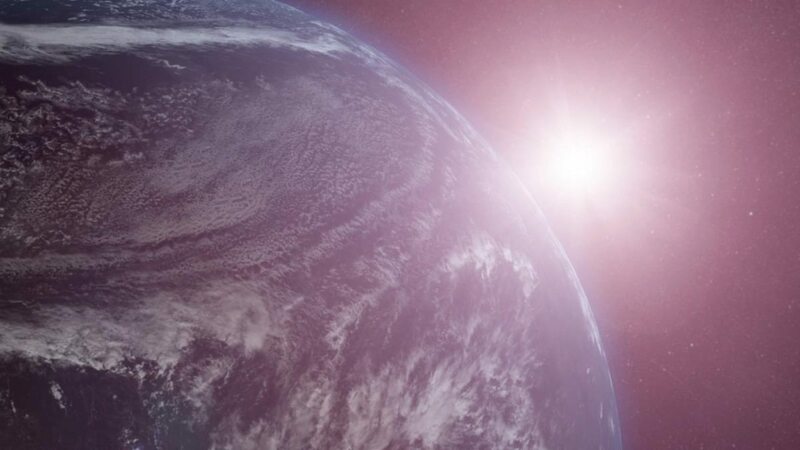 As part of a thicker nitrogen atmosphere it might have been enough to maintain Earth’s early oceans. Other ideas propose that solar flares from our young Sun helped heat our atmosphere, or that tidal heating from a closer young Moon contributed to Earth’s warmth. As it stands there is no definitive answer. So the faint Sun paradox remains a challenge, as it has since the dawn of time. Next time: Cosmic rays are powerful. Too powerful, in fact. The discussion heats up tomorrow. so maybe earth was closer to the sun ?? It would certainly be interesting to read papers which estimate temperatures of the Earth’s surface, over time, since the end of the Late Heavy Bombardment. It must have taken quite a while for the heat generated by all those impacts to radiate away. Another aspect, which I’m sure has been at least considered (though I don’t recall reading about it): there was a lot more radioactivity in the Earth’s early days. Not only was there a lot more U (and somewhat more Th and K40), but there were likely appreciable amounts of radioactive isotopes which we can no longer detect (e.g. Pu). Too, it may have been that the distribution of radioactives was different, with more closer to the surface, relatively speaking, than today. To K.J.’s point: if crustal plates moved around back then even somewhat similarly to how they do today, there’d be plenty of hotspots, where we find black smokers today. Whether these were underwater or not, the immediate environments would have been nice refugia, if not even where Earthly life began. However, I doubt that these would have been able to sustain much more than giant lakes of liquid water, much less planet-spanning oceans. But maybe plate tectonics was quite different, back then? I got the idea partly after watching a docu some time ago. There are some interesting subjects; Astronauts (3 minutes in) in the ISS discovered by accident that its elctrostatic that cluts salt or sugar grains together when freefloating in a plastic bag (it has been a mysterie how the first steps in planet formation happened). Another part (22 minutes in) is about ancient Banded Iron Formation found and dated back to a very jong Earth, 4.28bln years old (meaning surface water). And a third part (29 minutes in) about waterdroplets found inside ancient saltchristals originated from meteorites (points to water being present in young Solar System which could be partly the origins of Earths early water. Earth not only dumps heat by convection (tectonics, vulcano’s, hotspots etc), simple conduction also brings it outside. Maybe it was a factor back than? So more early volcanism and more early impacts need to be added to the equation.